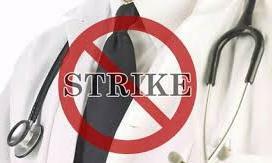 Nearly 20,000 doctors will engage in a token strike tomorrow (7) against the South Asian Institute of Technology and Medicine (SAITM). GMOA General Secretary Dr. Naveen de Soysa said, the government had ignored the concerns raised by the GMOA regarding the existence of SAITM and the fraudulent manner it deceives the public. According to Dr. de Soysa, simultaneous to the strike, the members of the GMOA, will keep away from private practice tomorrow. He pointed out that the GMOA demands include gazetting the minimum standards for medical education in Sri Lanka, the Health Minister accepting the SLMC Report on SAITM and informing the Higher Education Ministry that the SAITM was not in compliance with the SLMC standards, stop recruitments to SAITM and nationalize SAITM. "We have provided timelines to the respective ministers with our demands. However, the government did not respond to our demands. Hence, we had to go for the last resort of taking strike action. It should be noted that it is not only the GMOA that will be engaged in trade union action. The trade union action will halt the entire country," he added. Many other trade unions, including the National Trade Union Centre (NTUC) are also likely to join the strike.